We touched on this earlier this year, but it bears repeating – the accent color of 2012 is bright, bold and orange. The Pantone Color Institute recommends the reddish orange Tangerine Tango to replace last year’s pink Honeysuckle. The Academy of Home Staging explains that this color has a lot of depth, being dramatic and simultaneously seductive and sophisticated. It’s important to be conservative in the use of a vibrant color, however, otherwise it can overpower the surroundings. Selecting patterned trimmings that incorporate this color will give an edge to pillows, bedspreads, or tabletop accessories. For a more bold approach, painting an accent wall in a hallway, kitchen or entrance can create a dynamic burst of energy, the academy advises. Finally, never as well overlook ‘dynamizing’ – giving the room in your house that special look. Make sure that each room clearly conveys its function and purpose. For the bathrooms or toilets, the academy advises displaying fresh towels and toiletries like they do in hotels. 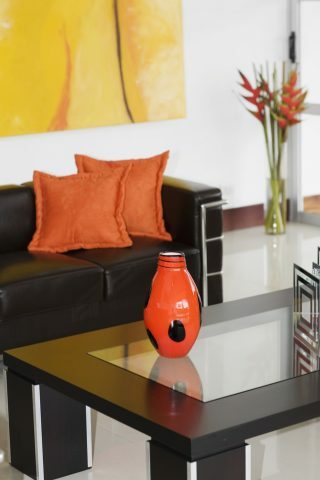 For the living room, put a vase of fresh flowers on the coffee table.